There's been a void in the LPAM market for a long time.... a big lack of an affordable, high audio quality and reasonably powerfull AM transmitter. That's why we sat down and designed AM MAX I. After evaluating the AM MAX I for a while we came up with a new design, this time based on DSP. This makes it possible to control parameters of the audio chain, such as the compression, low pass audio filter cut frequency and preemphasis via convenient menu system (control unit now comes with LCD display). Other features, such as the fully solidstate PWM modulator which ensures absolutely crisp modulation, heatsink that bolts to the enlosure for perfect cooling and LCD display unit make AM MAX II DSP really shine. Due to innovative PLL design this unit offers incredible low phase noise and is covering extremely wide frequency range. PLL steps are 1KHz just because nobody asked for less. Hardware supports much smaller steps. Units come with schematic diagram which shows the crucial details of the transmitter, making it possible to use the PWM and PLL in another design with higher output power. You can make use of the relay switch logic as well. Fuse and main on/off switch are now right on the PCB. Perfect for system integrators. Everything else can be controlled via display unit and the UP, DOWN and MENU keys. OEM version available on request. Distributors wanted. AM MAX II DSP comes in two versions, one for the broadcast band and one for the HAM bands. Broadcast version is available right now. HAM version should be available in about one month. 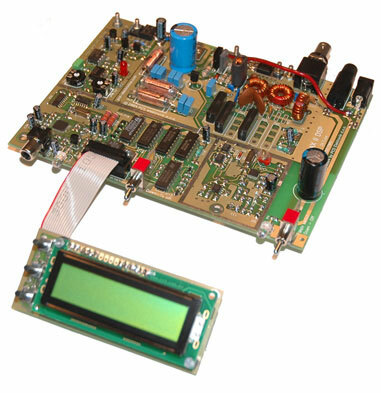 PLL supports up to about 30MHz. 19" rack enclosure units are available. These enclosures have enough space inside for two extra PCB's (holes are predrilled for them) and two extra apertures at the back for an optional Canon connector and SO239 connector. This gives you plenty flexibility and makes it easy to implement modifications/extensions. Have a quick look at the manual (AM MAX II DSP)! Have a quick look at the manual (LCD module)! - Modulation: AM (CW is possible with a small mod). Discuss AM transmitters in our forum!